When biomagnetic particle kits are initially developed, R&D companies work with small volumes in order to test and optimize a number of variables. However, as demand increases, the IVD company needs to be able to scale up the process. This scale-up must be done carefully so that large lots are not only internally consistent but as consistent as possible with each other. 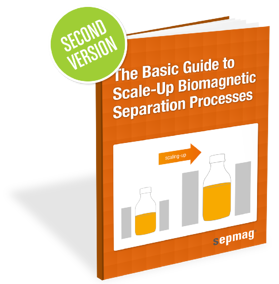 That's why we have prepared: The Basic Guide to Scale-Up Biomagnetic Separation Processes.